One of the important press releases that came out as a result of the AMD Financial Analyst Day has been some insights into how AMD is approaching the Carrizo and Carrizo-L platform. Have a read of Ryan’s round up of the Financial Analyst Day, which included some broad details about Zen and the big x86 cores, but Carrizo and Carrizo-L focus on AMD’s mobile strategy as well as describing the next iterations of the Bulldozer architecture (Excavator) and the Cat family of low power SoCs (Puma+). We covered some of AMD’s releases on Carrizo back in February, but despite the similar name Carrizo-L functions for a slightly different market by virtue of the different architecture. Carrizo-L features ‘Puma+’, which by virtue of the naming scheme suggests an updated version of Puma which was seen in Beema. What the ‘plus’ part of the name means has not been disclosed, as both Puma and Puma+ are reported to be 28nm, but chances are that the design has attacked the low hanging fruit in the processor design, rather than purely just a frequency bump. Carrizo-L will be advertised under the new ‘AMD 7000 Series’ APUs, featuring up to four low power separate cores up to 2.5GHz, up to 25W and up to DDR3-1866 support. These are aimed square at the Atom ecosystem within a similar power budget. Streaming Processors 128 ? 128 ? 128 ? 128 ? 128 ? AMD is stating that these APUs are currently available in Greater China already with a global rollout commencing in due course. 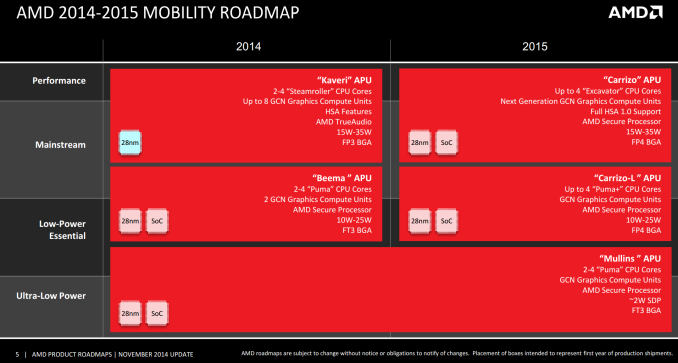 All APUs are listed with AMD Radeon graphics, although the Rx number has no indication as to the streaming processors in the graphics part – a similar situation happened with Beema, and all those parts came with 128 SPs, differing only in frequency which is likely the case here. The SoC design also ensures all the IO is onboard, including an AMD Secure Processor, which for Puma was a Cortex-A5 supporting ARM TrustZone. It is likely that Carrizo-L also uses only a single memory channel, similar to Beema. One of the more interesting elements is that Carrizo and Carrizo-L will share a socket, known as FP4. This means the processors are pin compatible, and what we know about Carrizo at this point suggests that both segments will play within the same sort of power budget (10-25W vs 15-35W). This allows OEMs to build two designs with almost identical hardware under the hood except for the SoC – would you prefer a single/dual Excavator design, or a faster frequency quad-core Puma+ design? There also leaves scope for differential integrated graphics performance, as mobile Kaveri up to 25W had up to 384 SPs or 3x what we are expecting with Carrizo-L. A lot of the performance metrics in this part will be down to binning the various designs, which adjusts the cost. At some point we will source a Carrizo-L low-power notebook in order to test the hardware – it would be an interesting data point to get a corresponding Carrizo design as well. Correct. Bulldozer has 1 module with two cores. While Bobcat family has just small cores, not modules. The HUGE question. Please ask AMD about that. DO CARRIZO COME WITH COLOR COMPRESSION LIKE TONGA? And if yes, that's for all of them, all the models? Having a Sempron 3850 I am disappointed to see that AMD abandoned that socket. While the SOC is great for an HTPC and a few other things thanks to those four cores, it does have it's limitations like HEVC playback. A Beema would have been a nice upgrade. Another thing to point here is that those two core parts, AMD should throw them in the dust bin and BURN THEM. It is utterly stupid to market those processors for use in PCs or laptops. You do make a few dollars from those SOCs, financially it looks correct, but the end result is someone getting a brand new, last generation dual core processor that it is going to disappoint him big time. So AMD's image is really destroyed at that person's eyes. Someone who buys an Intel Atom will blame himself for buying a low performing Intel cpu. Intel are the fastest right? So he will fix that by buing a faster Intel CPU. Someone who buys a dual core low end AMD, will blame AMD for the performance and will never again choose AMD. Will lock itself at Intel.